After the declaration of CCC Result candidates shall be can check their result by using Application Number and Date of Birth. Candidates are advised to preserve their CCC Application Number so that they can easily access CCC Result. The procedure to check CCC Result is given below. Update on 09/02/2019: CCC Result for January 2019 is released on the official website. Candidates can follow the link given below to check their results from 5th February 2019. Update on 19/01/2019: CCC Result for December 2018 is released on the official website. Candidates can follow the link given below to check their results from 11th January 2019. Update on 18/12/2018: CCC Result for November 2018 is released on the official website. Candidates can follow the link given below to check their results. 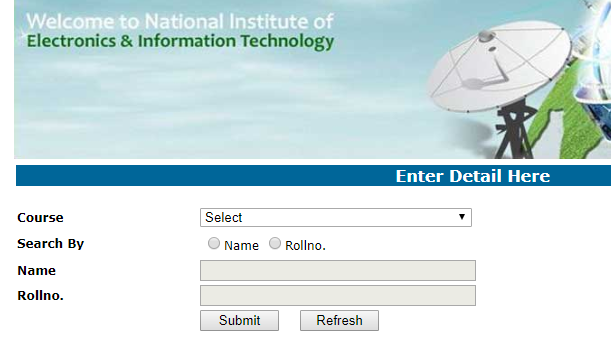 Visit the above mentioned website of National Institute of Electronics and Information Technology. Go to the ‘Student Zone’ and Click on the link of “Result’’. Click on the link of ‘CCC Result’. Click on the button ‘View Results’ which is placed in the column of CCC Examination. A new window will open, then select course. Choose the option to view result either by using Name or Roll Number. 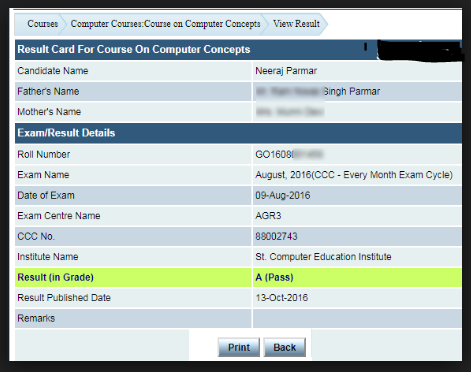 CCC Admit Card will appear in on the screen in PDF format. Take print out of it and preserve it for further use. Like other exams/test, marks are not provided to candidates who appear in the CCC Test. National Institute of Electronics and Information Technology provides the percentage to candidates on the basis of their performance in the CCC Test. According to the percentage secured by the candidates in CCC Test, Grade is allotted to them. The percentage range and the grade falling to that range is given below in the table. 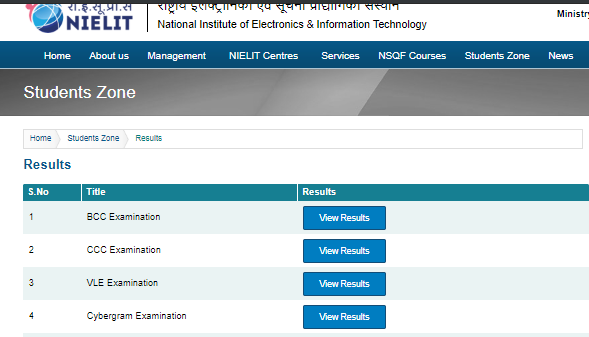 National Institute of Electronics and Information Technology will release CCC Result after the commencement of all phases of the examination. With the help of CCC Result, candidates shall be able to know the percentage scored by them in the CCC test. Candidates have to use Application Number and Date of Birth to check their CCC Result. Result May month tkk ajayega. 18 February 2019 “ccc” ka result kb tk ayega.. Your details are not available or maybe you have not registered for the examination. Hi Rahul, The Result for November 2018 Exam has been released. You can follow the link and download your result. You can download the result by visiting the official website. The candidates who have given exam on 6th October 2018 will probably receive their result in December. So kindly wait. When we are going to get the result of ccc which was held on 13 sep 2018? 7 august-2018 ko exam huya tha lekin result sow nhi Kar rha kyu? I got grade B in August 2018 cycle but I want to know my exact percentage of marks obtained. Is it possible because It is less than expected. Although it has no effect at all but I want to rectify my mistakes for future. kindly inform me 7 aug batch 3 ccc exam result when declare.in ithis site my role no,dob&exam not match. august ka result kyu show nahi kar raha not found hai plz reply me. Send your details here . मेरा result not found. Invalid roll no.and name and dob bata rha hai kai mai fail hu. Agar aapka result show nhi kar rha hai toh aap ek baar, apne saare details carefully check kijiye and doobara koshish kare. Agar phir se same issue aa rhi hai toh.. aap nielit k toll free helpline number pe try kare- 1800-11-65-11. Abhi CCC September ka result nhi aaya hai.Updates k liye aap article check kare.